Summary:Carbonite provides you with automatic backups of your files so you'll never lose any valuable information on your computer. – Accidents: 43% of people accidentally loses irreplaceable files every year. – Natural Disasters: Thousands of files are lost each year to fires, flood, and other disasters. – Theft: Only 3 out of 100 stolen laptops are ever recovered. – Drive Failure: Up to 13% of hard drives crash in the first year. Newest Carbonite DEAL! – Try Carbonite for 15 days free! There is no credit card required so you don't have to worry about being charged! Try it now! 15 Day Free Trial! – Click Here! With more and more businesses and people keeping valuable information on their computers, it's a matter of time before you should start considering backing up your data. Consider this, if today you were to lose all the files on your computer, how would you feel? How much would you pay to get it all back? Backing up your files daily (and automatically) with Carbonite and the ought of losing all your files, pictures, data will never happen again. Carbonite Online Backup does it all for you automatically. No need to buy expensive external hard drives and forget to backup your files, with Carbonite, all your documents, spreadsheets, presentations, emails, contacts and other important files are backed up daily and can be recovered anytime, anywhere. You can now try Carbonite for FREE for 15 days. No credit card is required. 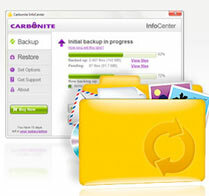 Carbonite is a small program that automatically manages your backups and helps you keep track of what’s backed up. Whenever you create new files or modify existing ones, the Carbonite program sends encrypted copies of those files over your high-speed Internet connection to a Carbonite data center. Your backups are transmitted using secure socket layer (SSL) security technology, and they’re stored at a state-of-the-art data center on highly reliable, redundant disk arrays. When you need to get your files back, the Carbonite software walks you through an easy-to-follow process that restores your backed up files to the right place on your computer. Not at your computer? You can get to your backed up files from any computer connected to the Internet — or even from your iPhone®, Android™ or BlackBerry® smartphone. Click here to try Carbonite. Online backup is growing immensely and for good reason. While there are other choices available for online back ups, Carbonite is the most affordable and best choice for you. There is NO limit on what you can store. So you don't have to worry about going over any limits. There's only one fee so you don't have to worry about any extra costs. Just download Carbonite onto your computer and forget it about because it takes care of everything for you. – Automatic backup files as you work without slowing it down. – You can retrieve your backed up files over the internet anywhere anytime. – 15 Day Free Trial!